A motion to amend the reform package was also passed at the full board meeting last Tuesday, undoing a previous change passed the week before in a committee meeting. The earlier set of rules – favored by Mr. McWater – would have given license holders greater privileges when selling their businesses. At the full board meeting, members described being variously bored or intimidated into granting the concession the week before. Mr. McWater dismissed that idea: “You’re telling me 13 people were so intimidated by me they all voted for something? I’m that powerful?” Mr. McWater said he will investigate how the reversal took place, as well as the COIB advice. Speaking late last week, Ms. Palitz described an “anti-bar militia” in the grip of a “war fantasy” determined to run bars out of the neighborhood. Ms. Palitz stressed that she was speaking in a personal capacity, not as a representative of the board. Rob Bookman, general counsel for the New York Nightlife Association, said the organization will support the bar owners. But whatever steps Mr. McWater and his allies plan to take, their options seem to be limited. Wayne Hawley, general counsel of the COIB, said that details of individual complaints are kept confidential. But he added that the board’s advice can only be challenged if it is made on the basis of incomplete information. Ms. Stetzer said conflicts of interest frequently arise in the community and that she is bound by law to refer them to the COIB. She did not regard last Tuesday’s recommendation as anything out of the ordinary. Bar owners appealed to Manhattan Borough President Scott Stringer. When he was elected in 2005 he worked to bring in new members to the community boards and bolster their ability to represent groups, including liquor license holders. One further hope for bar owners is that the SLA might limit the impact of the new rules. Community boards are free to set their own guidelines, but the State Liquor Authority is ultimately not bound by their recommendations. 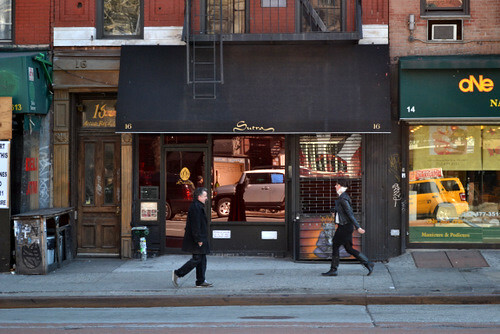 That was seen when Community Board 3 experimented between 2002 and 2006 with a refusal to hear any new liquor license applications for designated areas of the East Village. William Crowley, a spokesperson for the State Liquor Authority, said that, for much of the last decade, the liquor authority was very keen to hand out new licenses – something that contributed to the high number of bars now in the neighborhood. After legal challenges from community organizations, New York courts ruled that the authority was not upholding its legal responsibility. Since 1994, it has been required to demonstrate public interest when granting a new license in an area where there are more than three bars within 500 feet of each other. Following that ruling, the authority has been more cautious and Dennis Rosen, its current chairman, has met with representatives from 52 of the city’s 59 community boards since he was appointed just over a year ago. Mr. Crowley said the clarity provided by the new Community Board 3 guidelines should make the authority’s work easier. Meanwhile, Ms. Stetzer confirmed that Community Board 3 is moving ahead with implementing the new guidelines. A task force will be created soon to hammer out the final details of the rules.